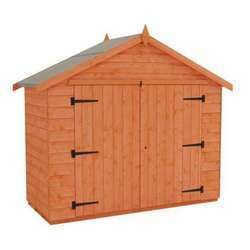 If you are looking for a safe, secure building, for bikes or garden equipment, then look no further than our range of Tiger Bike Sheds. Each of our wooden bike sheds is made from the highest quality European softwood, guaranteeing a sturdy space to house your bike. Combining practical design with high grade shiplap tongue and groove cladding, our bike sheds are built to stand the test of time. All of our buildings are crafted in our very own mill here in Yorkshire, ensuring we take personal care of the manufacture and delivery process, every step of the way. Each of our bike sheds come with extra large double doors, allowing a generous opening to a spacious internal storage area. 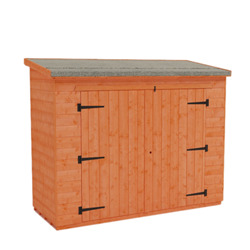 Built in a range of sizes, and with apex and pent roof options, we really do have a cycle shed that would fit perfectly into any outdoor space. 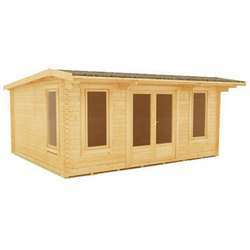 Whether it’s a storage solution for a bicycle or simply a place to keep the lawnmower, with heavyweight framing throughout, our wooden buildings are extremely robust and durable. The quality of these buildings is evident right through and the larger sizes fantastically accommodate several bicycles, or even make an excellent motorbike shed. Each of our bike sheds comes with a lock and key as well as shoot bolts, ensuring your contents are sufficiently protected. And for those looking to further enhance the security of your building, we offer a range of locks and security options to resist intrusion and leave you with guaranteed piece of mind. All of our wooden bike stores are finished in a stunning red cedar and topped with heavy duty green mineral felt, to complete the traditional design. 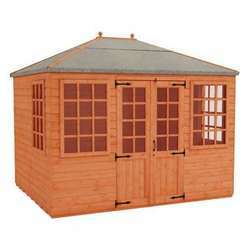 So if you’re looking for a durable, secure place to fit any garden space, then ride away with one of our Tiger wooden bike sheds. As we become enthusiastic cyclists and with bikes increasing in style and speed it is more important than ever to ensure you have reliable and secure storage. A bike shed is the ideal solution! Whether you're selecting from an Asgard Metal Shed made of galvanised steel or our discreet hand-constructed wooden shed, we are confident that each design will give you peace of mind. Available in different sizes you will be able to store a number of bikes without sacrificing valuable space around your garden or home. 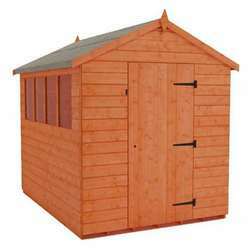 Here at Tiger Sheds we understand that to save space and money you may want to use your bike shed for multifunctional purposes. 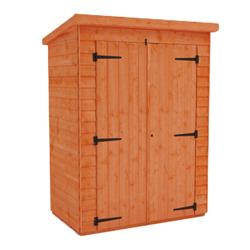 Therefore, we have both wooden and metal storage sheds which come in different shapes and sizes so you can fit a lot more in than just the one bike. You could use the space to store away expensive gardening equipment, big and small, and yet still have space to securely keep your bike safe. Saving you more garden space and money. 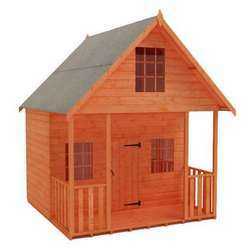 Metal sheds are often considered as the more secure option. 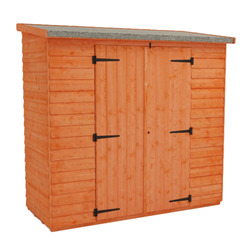 However, the Tiger Sheds range of wooden bike sheds are also incredible secure and for peace of mind come with a range of additional security features. We have a bike shed perfect for everyone’s bike, whether you’re storing just the one or maybe the whole families! You can pick between our stunning wooden and metal range and be assured that your bikes and equipment are securely stored away. 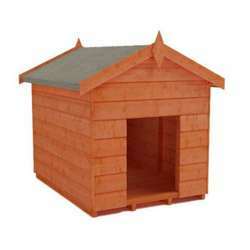 We offer free delivery on all of our products across most of the UK.